Weird things happen to stars when they run out of fuel. That's because the fuel doesn't just generate light and heat - it is needed to stop stars from collapsing! This is a problem that the bright white star in the right-hand-side of this new space photo has already faced. 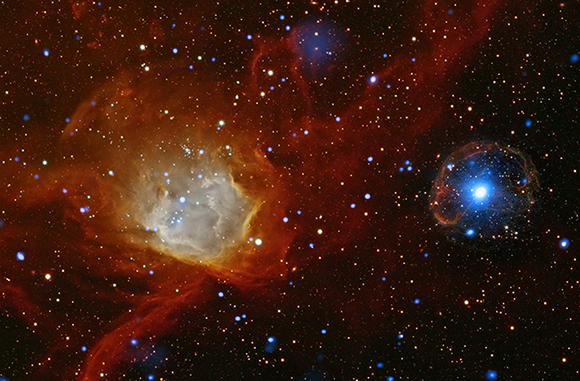 When huge stars use up all of their fuel supplies, their outer shells of gas explode. This is called a supernova explosion. Meanwhile, the core of the star survives the explosion, but it starts to collapse in on itself. It squashes what remains of the star into a tiny ball. That's what happened to the bright star in this photo. After the collapse, the tiny star is then called a neutron star. A neutron star has a mass about twice that of our Sun, but packed into a ball that is only 24 kilometers wide - that's about 60,000 times narrower than the Sun! Some neutron stars, like the one pictured here, rotate and give off a powerful beam of light from their north and south poles. These types of neutron stars are called pulsars. We can only see the beam of light from a pulsar when it points towards us as it rotates - like a lighthouse! Cool fact: When astronomers first discovered a regular pulse of light coming from what we now call pulsars, they didn't know what to make of it. In fact, the first pulse of light from space was nicknamed 'Little Green Men', because it was possible that aliens were sending out this signal!